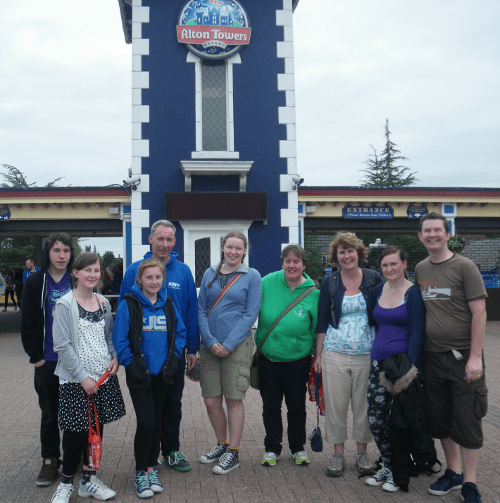 Our first day at Alton Towers was a great success, albeit slightly damp from the rain. Today was going to be different on many ways: it was sunny; it was the weekend, so queues would be longer; we were meeting other people from the #DOC. Us Winchcombes were in a bit of a rush to meet Derek’s family, forcing us to have a speedy breakfast all in a fluster and running out of the room to meet them in time. Pulling into the car park there were cars everywhere, far more than the day before…and to think we thought we were early. It took ages to get to the park entrance and by the time the we reached Guest Services there was a queue of 20 or 30 people there. Although the Guest Services queue was long we knew that time spent here, getting the ‘special access’ pass for the people with diabetes, would be time well spent, minimising queueing time at all the rides. Philippa and James met us in the queue and we chatted like we were old friends, not like people who had never met each other outside of Twitter before. Philippa also has Type 1 Diabetes and needed to get herself a ‘special access’ wristband. Derek and I had been tweeting with Vanessa-Louise who was running behind time so we said we’d meet for lunch time, or sometime afterwards. We headed straight to The Smiler, with the kids running, but kid-like James failed to appreciate an uneven path and tumbled head-over-heels denting more than just his pride. Philippa took him to get fixed up whilst we queued for The Smiler. It was only my family which went in, Derek’s stayed behind and unfortunately it took us ages to get through. However this “ages” was only 40 minutes and the real queue was already 2hrs long. Luckily our Smiler ride was brilliant and the ride worked well; more on this later. By the time we met up with Derek’s family they’d managed to ride Obvlivion twice using Chloe’s special access pass. Some of us went into Hex before we headed off to Thirteen, where the main queues were getting big already, but luckily our fast passes got us on in no time. We all loved this ride, it’s kinda cool. It was great to chat with Philippa and James, so nice to put faces to names and they’re such a lovely couple. We had lunch over in the Forbidden Valley (where Air and Nemesis are) with all 11 of us sat around a table. Amy did her blood test and was 16mmol. SIXTEEN! This was her highest lunch time result on a pump and we had no idea why. We felt embarrassed as her new insulin pump was meant to stop things like this happening. The mystery was solved a week later when I found out by looking at her pump’s data (on Diasend) that she never took any insulin to cover breakfast time. Forbidden Valley has got to be one of the better areas of Alton Towers, with Nemesis and Air which we all really liked. After doing Air again we met up with Vanessa-Louise and partner who told us the The Smiler had got stuck, with 16 people stuck at the top of the vertical incline. Rumours were about that they were there for 30 minutes, luckily facing up not down, and I felt my desire to ride this coaster again disappear. Off to the Log Flume and the 11 of us were split across three ‘logs’ – which actually turned out to be shaped like baths, which was more apt than we knew at that point. The ride was really long and there were ample opportunities to get soaked, as Derek found out to his cost. Watch the video to see it, at about 2 minutes 56 seconds in. The kids really wanted to go on Sonic Spinball which they’d not been on before so off went Chloe, Amy, Charlotte and Martin. 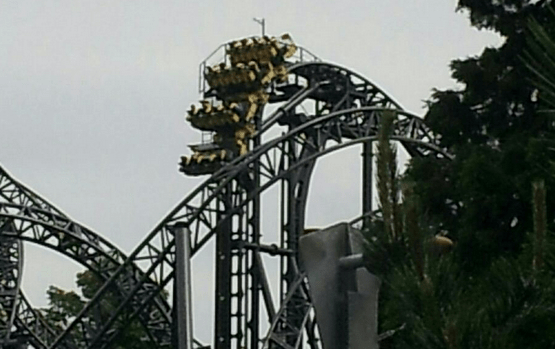 For the last ride we all did The Smiler, something I was a little worried about after it getting stuck during the day; but that couldn’t happen twice in a day right? Wrong! Derek, Philippa and James went first; then Chloe, Clare, Charlotte and Martin; then my lot. The queue seemed to take forever but we knew that some people had been in the queue for 3 hours so we could hardly complain about 30-45 minutes. Whilst waiting in the final boarding zone the ride broke down. It didn’t take Amy long to realise that Chloe was on the ride and broke into tears worried that she might be stuck up the top, without any dextrose or blood glucose meter. Eventually the ride got going again and Chloe etc returned looking not too shaken. The ride was tested again and again and again before they were happy for people to go back on it. Then it was our turn. It couldn’t break down a third time could it? Wrong! Going up the first 45 degree incline and the ride stopped again. This time Emilia got upset, worried that even if it got going again we’d get stuck at the 100% vertical lift. After 10 minutes the ride got going and we were happy to get off. Amy did a blood test, she’d shot up to 17mmol. No surprise there! SmilerGate aside it had been a brilliant couple of days. We’d all had a lovely time and enjoyed our tweetup. More over all the people with diabetes felt great about their special access passes and the benefits they brought. …that someone with Type 1 Diabetes can avoid queueing for ages at some theme parks? A couple of days ago I blogged about how to get a ‘special access’ ride pass at Alton Towers for people with Type 1 Diabetes. That article has quite simply broken all records with regards to views, it’s been so popular, so it’s obviously a subject dear to many peoples hearts. From responses to that blog and elsewhere I’ve decided to write another article to include some other theme parks. I’ll list a few of the other theme parks people have mentioned, here in this article. Please note that I’ve not tried these myself (yet!) so please just this information as a pointer and check out the park’s own web site for the current situation. If you feel any of the information is wrong or if you know of any other theme parks let me know too. Merlin, who own several UK theme parks (Thorpe Park, Alton Towers, Chessington), has set up the Merlin’s Magic Wand charity to put “the magic back into the childhoods of seriously ill, disabled and disadvantaged children”. In simple terms you apply for tickets and if you’re lucky you get some. This is a great idea but to be honest I’ll never apply as I’d prefer all available tickets to be used by people from families who can’t afford to take their kids to theme parks occasionally. I can, so we won’t apply. I would presume that being owned by Merlin (as is Alton Towers) that Chessington’s ride access pass would be similar but details seem sketchy and I’ve not heard of anyone trying it. It seems though that cheaper entry tickets may be able to be obtained you will pay the full rate for your Park entry ticket; also one helper will be admitted free of charge and one at a concessionary rate, providing the second is required to assist you on to specific rides and attractions. However they state that you must apply online, at least 24 hours before visiting the park and take photographic identification too when they visit. Someone told me that they did something similar at Legoland a couple of weeks ago saying “it really made a difference to our day”. I presume that this was using Legoland’s ‘Ride Access Pass‘ which allows an eligible person and three others to avoid queues for up to 10 rides during their visit. Number of people: eligible person and three carers. Thorpe Park is also owned by Merlin yet their offer is not as good, only allowing 1 helper, not 3. This must make it pretty tricky for families with just one parent as the helper has to be 14 or over. Angela from Texas let me know that her daughter went to Florida on a school trip and managed to get a fast pass. Re Disney, my eldest has just been to Florida on her school trip. I emailed prior to her going, gave the booking details etc and got a reply from customer relations which I printed off and gave to her. On her first day, inside the first park she went to the customer service/assistance desk and showed them her pump. They gave her a customer assistance card with her name on + 3 others. This card could be used in any of the theme parks at Disney. It didn’t put her right at the front, but it let her use the ‘assistance required access, which was a quarter of the waiting time..she regularly passed teachers and school mates standing in the long queues!! diabetes is quickly being removed as a reason for these passes, as they do not consider it a reason good enough. The best way to go is to mention that you are insulin dependent, and as such find if difficult to stand in queues without food etc which may result in a possible seizures.. Seizure is a good word that they don’t like!